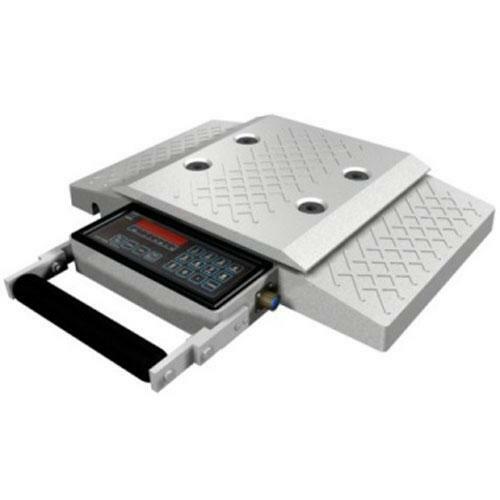 The MSI-5300 Load Ranger is a self contained weigh pad with an integral weight display. Load Ranger allows quick and easy vehicle weight inspections on most any improved road surface. Load Rangers self-contained digital display provides easy operator viewing of weights to the nearest 20 or 50 pound increments at an accuracy of 1.0%. Push-button controls for On/Off and Zero make operation simple with continuous use up to 40 hours. An optional external battery charger (110/230 VAC and 12 VDC) is available to recharge batteries conventionally or from vehicle power (Charges up to 4 batteries simultaneously). Load Ranger is backed by MSI’s exclusive limited warranty and is guaranteed to perform to your highest expectations. Quality sales and service are provided by MSI’s worldwide network of factory-authorized distributors. Your local distributor can present free product demonstrations and provide answers to your specific weighing application.